2. Place cherry tomatoes and halved bell peppers on a large baking tray, drizzle with olive oil, sprinkle salt and pepper and mix well. 3. Bake for 40 minutes until bell peppers are slightly charred. 4. Once baked, cover bell peppers with a kitchen towel until cool. 5. Peel skins off. Place both baked cherry tomatoes and peeled peppers in a food processor and blend until very smooth. Store in the refrigerator for up to a week. 1. Mix together salt, pepper, rosemary, garlic, lemon juice, and olive oil. 2. Pour over chicken thighs, mix well, set aside for about an hour. 3. Heat a teaspoon of olive oil in a large non-stick frying pan on low-medium flame. 4. Place chicken thighs, sear for 2-3 minutes on each side. 5. Once golden brown, cover and cook for 2 more minutes on low flame. Set aside for 2-3 minutes covered before slicing. 1. Cook 4 large handfuls of whole wheat pasta. 2. Heat 1.5 cups cherry tomato sauce in a large wok. 3. Add pasta, drizzle 2 tablespoons extra virgin olive oil, stir. 4. 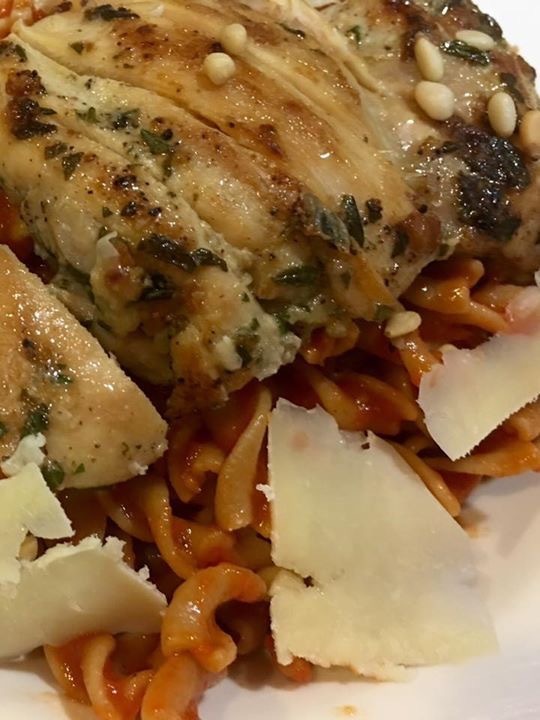 Serve hot with garlic rosemary chicken and some shaved parmesan.